When choosing the best fat burning exercises, you want exercises that will use a lot of muscles at once. In my opinion the traditional “Big 3” and all their variations are the best for this. When I say the “Big 3” I am talking about the Bench Press, Squat and Deadlift. In my opinion they are the best exercises for burning fat because if they are done correctly, each exercise is a full body exercise. When most people think of a Bench Press they think of it as a chest exercises. This is true and it mainly uses the chest, shoulders and triceps to control and push weight. What a lot of people don’t realize is that if you do it correctly, the back and legs also are involved. The Squat is a great lower body exercise. It uses some big muscles like the glutes, quads and hamstrings to lower and raise your body and the weight. When going heavy, this exercise requires a tremendous amount of core strength as well as upper back strength. Most people will categorize the Deadlift as a back or leg exercise. I usually use it when training back but it really uses both muscle groups a lot. In addition it requires a good grip and trapezius strength. So when designing a program, if a person does not have any mobility issues or injuries, I usually try to incorporate some version of these exercises. I’ve often spoken to people about the benefits of these 3 exercises. It would be too easy for me to just pick any of the Big-3 so I wanted to leave them off the list to challenge myself. There are other exercises that are also highly effective, so I’ve decided to select the 5 best non-Big 3 exercises that will help you burn fat. When eliminating the “Big 3” from consideration I wanted to leave off all their variations as well because it would be easy to replace them with a similar exercise. For example, a front squat can easily work the same muscles as a traditional squat so… they are all out. This means no squats, front squats, pause squats, box squats, one leg squats, pin squats, pistols and since step ups are pretty much the same movement as one leg squats, I’m not choosing step ups either. This also means no bench press, dumbbell bench, incline bench, dumbbell incline bench, decline bench, close-grip bench as well as pushups since the body is doing a similar movement. Deadlifts are also gone. So are, sumo deadlifts, trap-bar deadlifts, Romanian deadlifts, rack deadlifts and single leg Romanian deadlifts. So with all those exercises eliminated, keep reading to see what I chose as the best of what’s left. This had to be my first choice. I really like this one because it is difficult to perform and it works the whole body. It puts a lot of emphasis on your shoulders, abs, core and legs but you are using all your other muscles as well.If you can learn the proper technique and perform it well with a lot of weight, you will feel like you can accomplish anything. First off this exercise requires a ton of shoulder and hip stability. You start by lying down and holding a weight straight up with one arm. The weight is usually a Kettlebell , but a dumbbell can work as well. While still controlling that weight with one arm, you start by doing a sit-up. This takes a lot of ab and core strength, and since you are still holding the weight your shoulder stabilizers are still working. From the seated position, your non-weight arm will stabilize on the ground so you can raise your hips in the air and swing a leg under your body so you can transition to a kneeling position. This takes some good hip flexibility and glute strength. The kneeling position puts you in perfect position to do a forward lunge. The core and the shoulder still is stabilizing your body because the weight is still held straight up and down. From the standing position your will now do the exact opposite to transition back to the lying down position. When you get there… that is one rep. I usually start my clients with 5 reps on each side because each rep involves a lot of muscles and different movements. Getting the technique down takes a little bit of practice so I suggest starting light and if you have any issues with your shoulders, hips or knees, you may want to skip this one. This is can be a very difficult exercise so it’s not for everyone, but if you have the strength and stability for it, you should definitely add TGUs to your fat burning routine. Since this can be a complicated exercise with a lot of moving parts, the video below goes over the proper technique. Since there are not a lot of good options for hitting all the leg muscles at once with no squats or squat variations, I had to choose wisely. Bulgarian Split squats (which I’ve always called one-leg lunges for some reason) are a good option because it really helps with hip flexibility, but since there was the word “squat” in its name I decided to leave it off the list. I was also thinking about including Farmer Walks since they do work the lower body pretty good but they require a lot of upper body strength, especially grip strength, in order to effectively hit the legs in my opinion. In the end I decided to go with Reverse Lunges. You can make the argument that a lunge is another squat variation since they are similar to a one leg squat or a pistol, but I think the leg in the back makes it a different exercise since the back leg is pushing in a unique way. After the eccentric phase (part where you lower your body) of a normal lunge you step backward. This always seemed unnatural to me. This doesn’t make it a bad exercise though since not all movements that are beneficial are natural. The reverse lunge is great for working the lower body and requires a good amount of control with the upper body and core. You can make this exercise more challenging by holding some weights to your side or overhead. Just like with the Split Squat, the Reverse Lunge is a great exercise for improving hip flexor mobility. I often use this as a warm-up exercise for that reason. You can do this exercise alternating legs or you can focus on one leg at a time. When I do it, I tend to do it one at a time to keep the tension and pump on one leg, then switch it to the other. When I use it as a warm up I’ll do it alternating. A dip requires something to hold yourself up with. There are dip stations but I’ve seen people get creative. So once you have your arms extended you lower yourself by bending your elbows then you raise yourself again by extending your elbows. Dips are mainly thought of as a triceps exercise but it’s a great exercise that also targets the chest and shoulders. How you hold your body makes a difference in what muscles are the focus. With a straighter posture the triceps will get more work and when you lean forward you should feel the chest a little more. The baseline for the exercise is with one’s own bodyweight, but you can add a Weighted Dip Belt or Steel Chains to make you heavier and make the exercise harder. If your own bodyweight is too difficult for you some assistance can be provided with some Resistance Bands or a assistance machine. Bench Dips are an easier variation that is done between two benches. People often add a few plates in their lap to get more resistance. With deadlifts out of the equation, pull-ups are my top exercise for the back. They are another great bodyweight exercise and are a good compliment to dips. These two exercises will work all of your major upper body muscles. A pull-up is as simple as it sounds. You hold onto something stationary over your head, usually a bar, and pull yourself up. Pull-ups primarily work the lats, rear delts, and biceps. The grip muscles also get some work during the exercise. Leaning back with a closer grip during a pull-up will emphasize more of upper back muscles like the rhomboids and lower trapezius. One of the most important things to remember when doing pull-ups is to squeeze your shoulder blades together and stick out your chest. Far too often I see people doing pull-ups with their shoulders rounding and their chest caving in. Different grips will also hit the muscles a little differently. The normal pull-up grip is an overhand grip. An underhand grip where the palms are facing toward you is technically a chin-up, but I’ve heard some people call it a reverse grip pull-up. Having your palms face each other is another variation which is similar to the grip for a seated row. All of these help to add some variation to the exercise. Just like with the dip, the resistance can be adjusted with Resistance Bands and assistance machines to make it easier and a Weighted Dip Belt to make it harder. Fat Gripz can also be used to make the bar thicker and increase the difficulty. One a side note, I am not a fan of kipping pull-ups at all. These are pull-ups where you swing your body and use the momentum to help you pull yourself up. They might be great if you are doing a crossfit competition, but not so great if you are really looking to work your muscles. If I had to pick a forth exercise to add to the “Big-3” this would be the one. The Standing Overhead Press primarily targets the shoulders, but the core, glutes, lats, triceps and chest are also involved. Basically this exercise involves holding a bar at your chest and then extending your arms and pressing it over your head. The pressing movement is very similar to a bench press. When the bar is coming down, you want to be thinking about breaking the bar and when you are pushing it up you want to think about pulling t it apart. As with most exercises you want to try and crush the bar to keep the grip tight and all the surrounding muscle activated. Another important aspect of this exercise is the body position. You lean back a little when it is on your chest, and then move your body more upright as it clears your head. When you do the lean, make sure that your entire torso moves together and it’s not the lower back arching. Tightening your core and glutes during this exercise are extremely important to a good lift and it also helps to prevent lower back problems. A Standing Overhead Press is also called a Military Press and can also be done seated. Although I can’t lift as much weight, I prefer the standing version since more of your muscles need to work for stabilization. The Behind-The-Neck Press is another variation that hits the shoulders a little differently. The middle and rear heads of the deltoid are targeted a little more with a Behind-The-Neck Press. A common mistake people make with the Behind-The-Neck Press is they move their head forward which puts a lot of stress on their neck. Flexibility in the shoulders is required for this exercise so that the arms can move the weight around the head. A lot of people don’t have that flexibility to do it right so I hardly even use the Behind-The-Neck Press with my clients. Planks are the foundation of most core exercises. A strong core translates well into strength in a lot of other exercises. I would add this to an everyday ab routine. I left this off because the standing overhead press and TGUs put a lot of stress on the core so it does get worked with those exercises. Bent-Over Rows is one of the best back exercises. If Pull-ups are my number 2 back exercise, Bent-Over Rows has to be 2A. This exercise effectively hits the upper and lower back. The reason I chose Pull-ups over Bent-Over Rows is more of a personal preference, but you can’t go wrong with Rows. I also prefer using a barbell on this exercise instead of dumbbells because that is what is harder for me, but dumbbells are good too. I usually do this with an overhand grip, but you can use an underhand grip if that feels more comfortable. Using Fat Gripz with this exercise makes it even tougher regardless of what grip you choose. Band Pull-Apparts is a great exercise for developing the upper back. It is a really important exercise that everyone should do, but it’s not so great in terms of fat burning. Even so, I did want to mention it because it’s helps every other exercise you do. Basically jut grab a Resistance Band and pull it apart. It seems like it would be easy to do but maintaining the proper form for a lot of reps can get challenging. It is important to maintain good shoulder and wrist position when pulling the band apart. This exercise helps with postural issues in the shoulders and tight pecs by strengthening the opposite muscles in the back. This is a high-rep exercise that can be done every day and really helps building strength. The Leg Press is not my favorite leg exercise, but it does a good job at getting a burn in the quads and hamstrings. The reason this is not my favorite is because the hips are in a locked position on the machine so the glutes and hip flexors don’t get a chance to move too much. If you are after a good burn and don’t care about hip movement there isn’t much that beats a moderate weight with high rep set of leg press. Glute Bridges are good for working… wait for it…. the glutes. It helps the female that want a nice behind and helps males that want to lift heavier. In my opinion the glutes are the most important muscle in the body because they should be the main driver of the boy when walking and running. Strong glutes are also important for stabilization and can help to counteract tight hip flexors. The can be done from the floor but I like to do them with my back on a bench. I mentioned Farmer Walks briefly but ultimately left them out to put in other exercises that target more specific areas of the body. Make no mistake though, farmer walks are one of my favorite full body exercises. I usually feel them in my hands more than anything, but the legs are moving and the rest of the body is stabilizing. The core and traps are key stabilizers. You can do this holding 2 barbells, 2 dumbells, a trap bar, or anything else that gives you enough weight to hold. I also briefly mentioned Bulgarian Split Squats (or as I call them…one-leg lunges.) It was either this exercise or Reverse Lunges and as I already mentioned I left them out because of their name.I love adding them into my routine to stretch out the hip flexors. I try and get as deep as I can with this exercises. So those are my picks for the best fat burning exercises. Do you agree? Let me know what you think of my picks. Leave a comment on the Muscle Building Foods facebook page or on twitter is here. Also if you haven’t already, check out my FREE eBook, where I cover the 12 biggest mistakes that people make when trying to get fit. 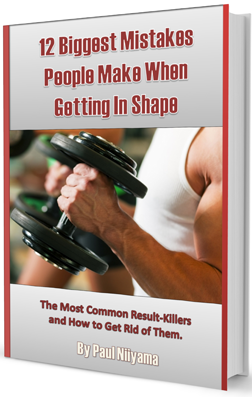 If you’re really looking to supercharge your results then this book is for you. I also cover the fixes to these problems. Get Instant Access to your eBook here. Thanks for reading and GO SMASH IT!!! ← What you don’t know can hurt you: What Is cholesterol?